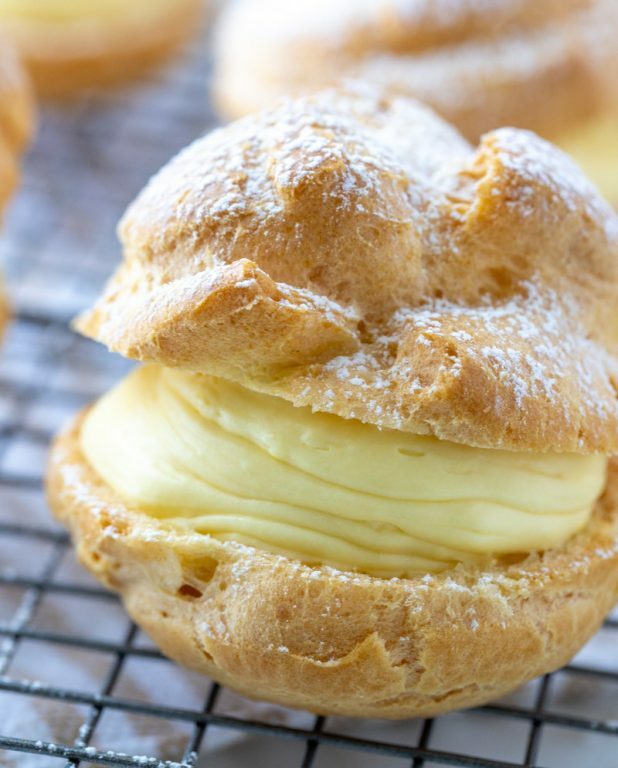 My famous Homemade Cream Puffs recipe: light and airy cream puffs filled with vanilla pudding cream are always a hit with family and anyone I’ve served them to. If you want an impressive, pretty dessert for Christmas or any holiday, this one is it! Oh my gosh. 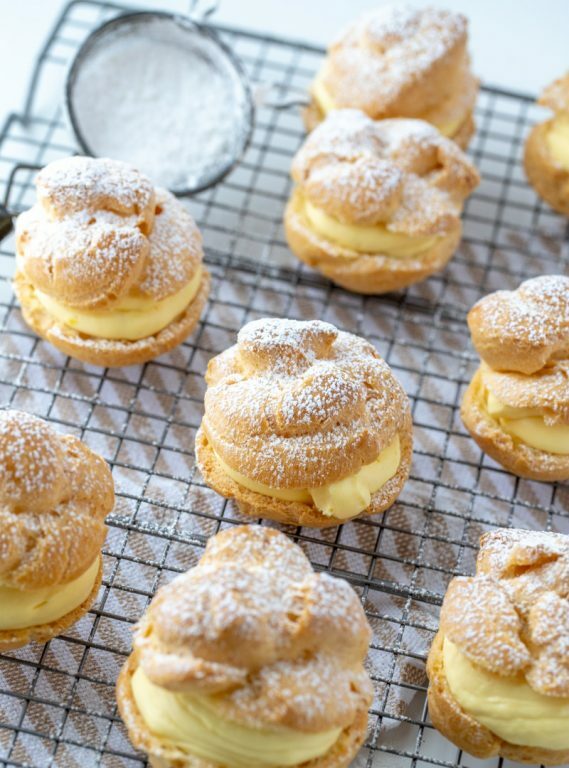 Say hello to the best homemade cream puffs ever! It’s my dream to go to Paris someday and taste a real French cream puff. That is not the only reason I want to go to Paris, but it is definitely one of them. I’m all about the food when I travel to new places. Is that even normal? In Italy, I was all about the almond macaroons and the Italian Ricotta Peach Cookies that I quickly recreated at home. I will make it to Paris someday, but for now, I’m excited just to be able to make delicious and beautiful homemade cream puffs right at home in my own kitchen. They are surprisingly really easy to make – see for yourself! I’m actually embarrassed a tiny bit at just how easy these homemade cream puffs are to make that I should probably go ahead and eat two more before telling you the deal. You can do this! Follow the directions closely and carefully and they will come out puffy and perfect and “wow” your guests. I would love if these became a family tradition for you as they are for me. I really really love sharing desserts with you that aren’t specific to just one holiday. My Italian Ricotta Cookies and my Cinnamon Roll Cake are a good examples of that. 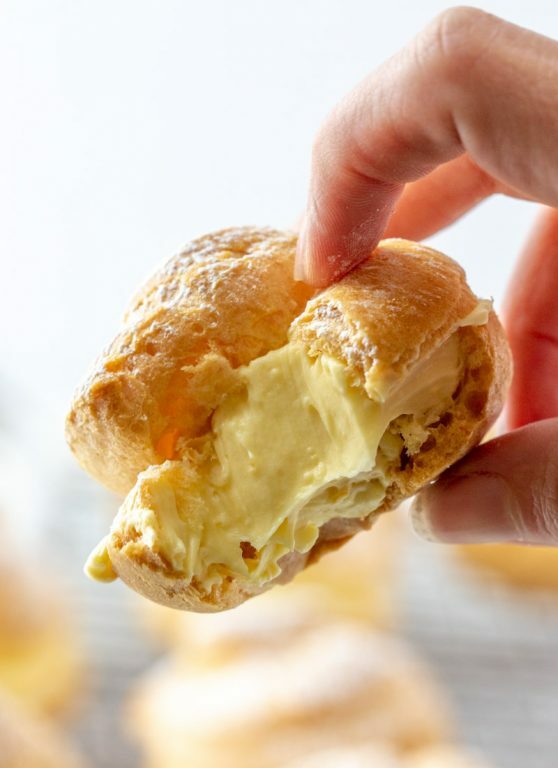 Cream Puffs always remind me of Christmas and Easter, but they really can be made for dessert any day of the year and be perfectly acceptable. “Timeless desserts” are the best and what I like to call them. The lightness and fluffiness of this batter makes these turn out amazingly good. They taste the best fresh soon after you make them. If you love light and fluffy desserts, also try my Lofthouse Sugar Cookies. 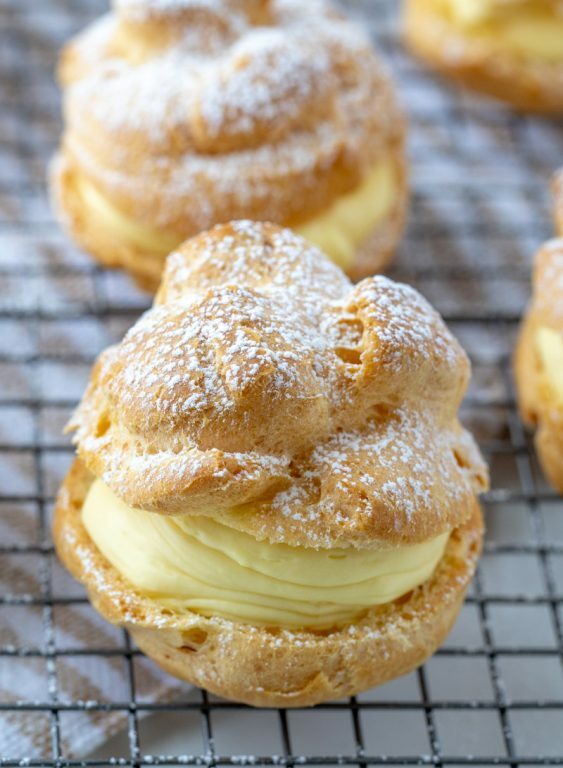 Don’t be intimidated to make homemade cream puffs at home anymore! If I can do it, you can do it. Check out my how-to video of me making the recipe for these Homemade Cream Puffs! 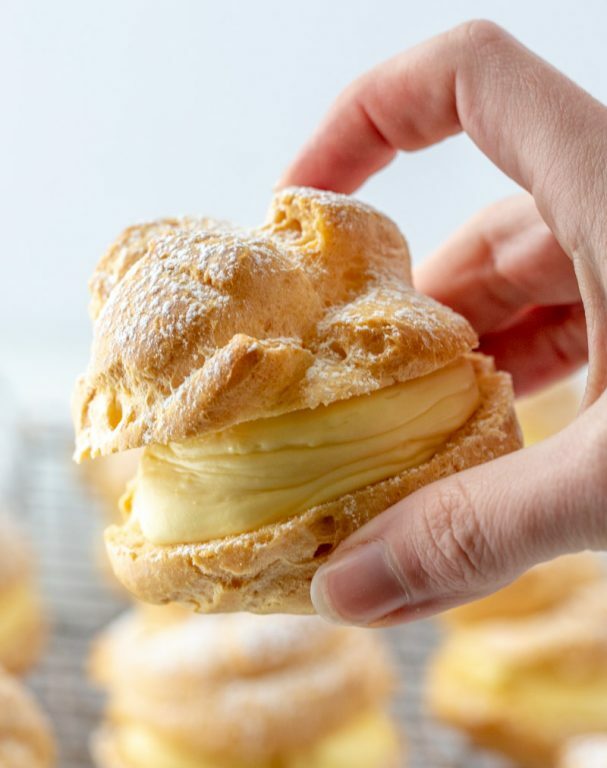 My famous Homemade Cream Puffs recipe: light and airy cream puffs filled with vanilla pudding cream are always a hit with family and anyone I've served them to. If you want an impressive, pretty dessert for Christmas or any holiday, this one is it! Mix together vanilla instant pudding mix, vanilla, heavy cream and milk. Cover and refrigerate to set. Place the butter and water in a heavy saucepan over medium heat and bring to a rolling boil. Remove from heat and with a wooden spoon or spatula, quickly add the flour mixture. Return to heat and stir constantly until the dough comes away from the sides of the pan and forms a thick smooth ball (about a minute or two). Transfer the dough to your electric mixer and beat with a mixer on low speed a minute or two to release the steam from the dough. 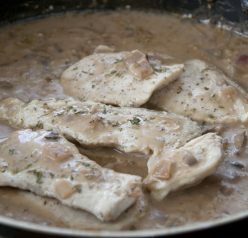 Once the dough is lukewarm start adding the eggs one at a time and continue to mix until you have a smooth thick paste. Spoon or pipe mounds of dough onto a baking sheet covered in parchment paper, spacing them a couple of inches apart. Bake at 400 degrees for 15 minutes and then reduce the oven temperature to 350. Bake for a further 30 to 40 minutes or until the shells have browned and are dry inside. PRICK EACH PUFF WITH A TOOTHPICK to allow steam to escape and prevent them from falling/flattening. Turn the oven off and, with the oven door slightly ajar, let the shells dry out for a further 10-15 minutes. When the shells are cool, either split and fill them with the pudding mixture, or use a pastry bag to pipe the pudding into the shells. Dust with powdered sugar. Enjoy! This is exactly how my mom taught me to make cream puffs! Yours are amazing! Not only beautiful and delicious, but also fun to make. Great recipe! These look amazing! Definitely trying this recipe! Can these be made with sugar free pudding to be diabetic friendly? Yes they definitely can be! These are really awesome! Thanks for sharing the recipe! I’ve made this filling substituting chocolate Godiva instant pudding and it’s amazing! I’ll make both flavors for parties and they’re always gone! I love this idea, Darcy! When do you prick them? I believe it is listed in step #7. Does this freeze well? I am traveling a few hours and thought I would freeze them and let them thaw as we traveled. I fill them with fruited chicken salad for special occasions. Yum! Sounds like a great idea. Can you use cook and serve pudding instead of the instant? Would I make the pudding as instructed on the box? Thanks! Can you please tell me how many cream puffs this recipe make? Thank you! I got about 16 puffs! Can these be froze ?? Yes it should be fine frozen. Do u whip the whipping cream before adding to pudding? No. Don’t whip it first. Would these be fine made the day before and kept in the fridge, or would they get soggy? I would think they would get a bit soggy unfortunately. YES-cream puffs are the best!! How many days ahead can you make and bake the pastry? I would say just one day ahead. Quick question…since I put these on 2 separate pans do you think I could use convection feature on my oven and bake them both together? Thanks in advance! You said the recipe makes about 16 puffs. How big are the mounds, like a 1/2 cup?? Yes about that size. Give or take a little! What did I do wrong…I followed your recipe to the exact note…vanilla, heavy cream, milk and mine came out as water 🙁 I placed it in the fridge and still watery…added another box of pudding…still watery….Please tell me what I did wrong….the puffs I had to put in a muffin pan in order for it to rise….I really desire to make these, had my mouth set to taste them….I am determine to get this right….can you please tell me what I did wrong? Be sure you have INSTANT pudding and it is the size which calls for 3 cups of milk in the directions (the milk and cream in this recipe makes it richer), the pudding will not work with soy milk. The oven should be preheated to 400 and don’t use an air pan, doesn’t get hot fast enough. Believe the salt goes in at the beginning. Important that the dough cools slightly before adding the eggs one at a time. Been there, done that. 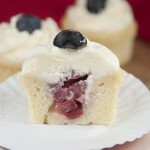 Great with whipped cream and sliced strawberries or other fresh fruit. I have made this recipe twice and they are delicious. Light and not too sweet. I served them with berries and vanilla ice cream on the side. I followed the recipe exactly as written. Our guests were impressed! ???? Thank you for the recipe. 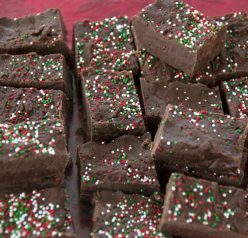 My husband is absolutely crazy about these…..I filled them with chocolate ganache whipped with heavy cream (more whipping cream than ganache)…super-yummy!!!! I’m so glad to hear this, Frances! does the butter have to be salted or unsalted? What is the ‘flour mix’?? The flour + what was added to it in previous step. I want mini puffs. Would a Tablespoon full of dough be sufficent to make them mini size or is that too much?